This modest apartment building is included in the National Register’s East Jefferson Avenue Thematic residential structures district. It is an appealing and interesting building, but certainly is not among the most architecturally significant structures that you find in Detroit. Compared to New York, Chicago and Philadelphia; Detroit has relatively few apartment buildings. That is attributable, in part, to the availability of low-cost land for building single family homes in Motown and, in part, to the lack of great mass transit systems in the city. Early in the last century, Detroit officials considered building a subway under Woodward. But that construction was not undertaken. During the Depression decade when Keynsian macroeconomic ideas influenced federal policy decision, Detroit and Chicago competed to obtain funds to build a downtown subway. The Roosevelt Administration decided that Chicago would win that competition. I do not find the presence of the automobile industry in Detroit as a powerful explanation for the relative dearth of apartment building in the city. East Jefferson Avenue area was a popular and upscale residential area before World War I. The area was first developed for residences by Francis Palm before the Civil War. As the city’s businessmen amassed great wealth, many of them decided to build impressive homes along East Jefferson. Almost all of them still stand and are listed on the East Jefferson Thematic Resource Historic District. I infer that those who invested in this Manchester Apartment building did not have the resources to erect a large multi-story building, so they constructed the handsome structure that you see. Unfortunately, I know little about this building. Given its small size, I presume the investors selected a local architect, but I do not know who designed it. I do not know how many units are currently included in this red brick four-story building. I believe that there are about 25,200 square feet of usable space. Also, I do not know why the name Manchester was chosen. If you have answers to these questions, please send me an e-mail at: renf@umich.edu. Several of the older apartment complexes along East Jefferson have been renovated in the last decade or so. I have not read about any plans for the modernization of this building. National Register of Historic Sites: #85002941. 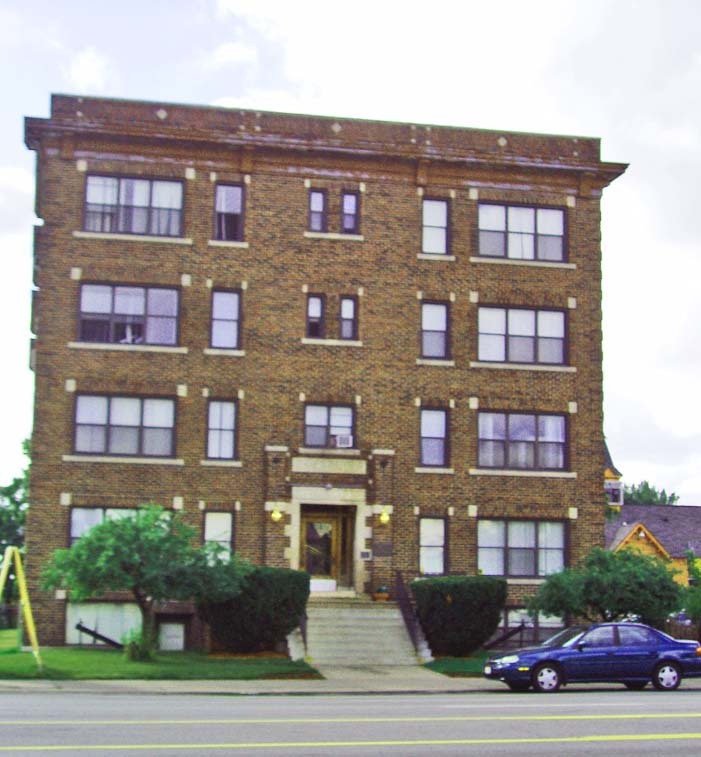 This building is included within the East Jefferson Avenue Residential Thematic Group. Use in 2010: Apartment Building. I believe this building was for sale in 2010 with an asking price of $525,000.